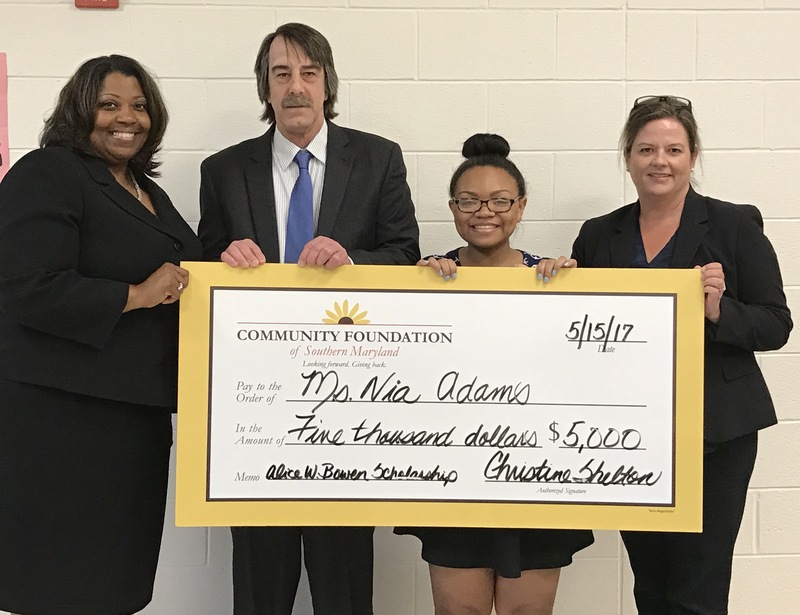 Nia Adams, the recipient of the 2017 Alice Bowen Memorial Scholarship, was inspired to pursue a career in nursing by her maternal grandmother, who worked in the maternal health field for over 40 years. 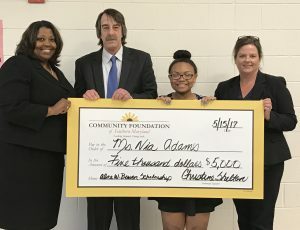 Thanks in part to a $5,000 grant from the Community Foundation of Southern Maryland, the Northern High School graduating senior will have the opportunity to follow in her grandmother’s footsteps. Nia has been accepted to Towson University, where she plans to major in nursing and biology. Her goal is to become a neonatal nurse or perhaps a neonatal intensive care unit (NICU) nurse. To help her prepare for her future career, Nia supplemented her high school classes by attending the Academy of Health Professions at the Calvert County Career and Technology Academy. The Alice Bowen Memorial Scholarship provides a scholarship up to $5,000 annually to a Calvert County public school graduating senior who has completed the Academy of Health Professions program at the Career and Technology Academy and intends to pursue postsecondary education in the area of health professions. Applications are announced every February and awarded on the following May 15. For more information on how to apply for or donate to the Alice Bowen Memorial Scholarship, visit the fund’s home page. The Community Foundation of Southern Maryland builds charitable funds that support community needs and opportunities in Charles, Calvert, and St. Mary’s Counties. We offer donors a wide range of endowed and non-endowed fund vehicles, and we work closely with families, individuals, businesses, estate attorneys, and financial planners to design gift plans that fit every economic situation. Our goals are to ensure that donors receive the most benefit from their charitable contributions and that their philanthropic dollars are used to the fullest potential. The vision of the Community Foundation of Southern Maryland is to make Southern Maryland the best place to live and give. For more information about the Community Foundation of Southern Maryland, please call 240-670-GIVE (4483), email director@cfsomd.org, or visit www.cfsomd.org.